Everything on the screen looks vibrant and beautiful, with true blacks, stunning colors, high brightness, and a 1,000,000 to 1 contrast ratio. Crafted using durable glass on both the sides, this phone, with surgical-grade stainless steel, is water- and dust-resistant. Navigating your phone using familiar gestures will be intuitive and natural. All it takes is a simple swipe to take you to your home screen from anywhere. Experience secure authentication with its Face ID; it projects and analyses more than 30,000 invisible dots on your face to create a depth map. What’s more, enabled by the TrueDepth camera and equipped with an adaptive recognition, the Face ID adapts to your face’s physical changes over time. Click beautiful selfies with sharp foregrounds, blurred backgrounds and impressive studio-quality lighting effects. Thanks to the TrueDepth camera, this phone analyses more than 50 muscle movements to mirror your expressions. 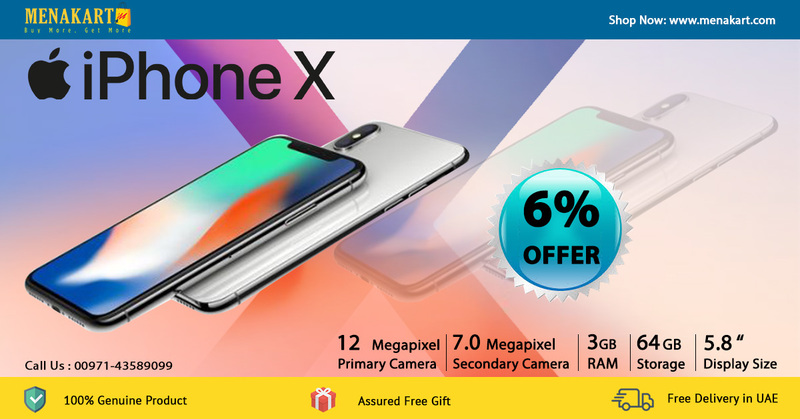 Its dual cameras feature a large and fast 12 MP sensor, an optical zoom, a color filter and a telephoto camera with OIS, so your pictures and videos come out bright and precise even in low-light conditions. Thanks to its Portrait Lighting, depth-sensing cameras and precise facial mapping, you can click professional-quality photos. Equipped with the A11 Bionic chip designed by Apple that boasts four efficiency cores and a neural engine, you can experience fast performance and smooth multitasking. Its second-generation performance controller along with its custom battery design makes this phone’s battery last long between charges. Thanks to its Apple-designed three-core GPU and powerful A11 Bionic chip, you can enjoy unbelievable augmented reality experiences in apps and games. No more cables and wires - charge it wirelessly using charging stations and mats. Send Animoji in Messages, discover new music with friends on Apple Music and let Siri be your personal DJ.